Massachusetts Sen. Elizabeth Warren is joining with Wisconsin Sen. Tammy Baldwin to urge early voting ahead of Tuesday’s election. About 300 people attended a morning rally with Warren and Baldwin in Madison. They were also campaigning at a Milwaukee union hall later in the day. Both Warren and Baldwin emphasized their support for the Affordable Care Act and Republican opposition to it. Baldwin’s opponent Leah Vukmir opposes the law and has campaigned on her pledge to vote for repealing it. Warren is the latest possible 2020 presidential candidate to campaign for Baldwin in the state. She says the clock is ticking on Republican control of Congress and other offices across the country. Baldwin says “health care is on the ballot” and called for supports to vote early. A fourth likely 2020 Democratic presidential candidate is in Wisconsin to boost early voting efforts ahead of Tuesday’s election. U.S. Sen. Elizabeth Warren, of Massachusetts, was holding a pair of rallies Friday for Sen. Tammy Baldwin and other Democrats in Madison and Milwaukee. Her visit comes after California Sen. Kamala Harris, Vermont Sen. Bernie Sanders and former Vice President Joe Biden have come to the state in recent days. Baldwin faces Republican Sen. Leah Vukmir. Polls show Baldwin with a double-digit lead over Vukmir, a state senator. Republican Gov. 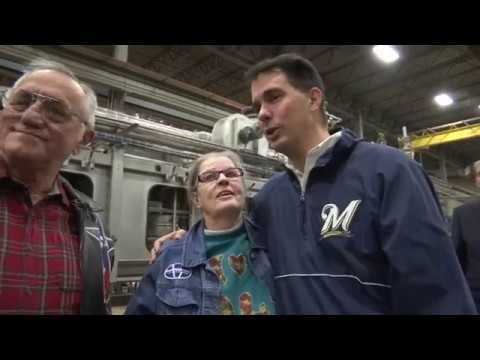 Scott Walker and his Democratic challenger Tony Evers were also traveling the state Friday as polls show their race to be a tossup. On Saturday, Vice President Mike Pence planned to hold a rally for Walker in Hudson.